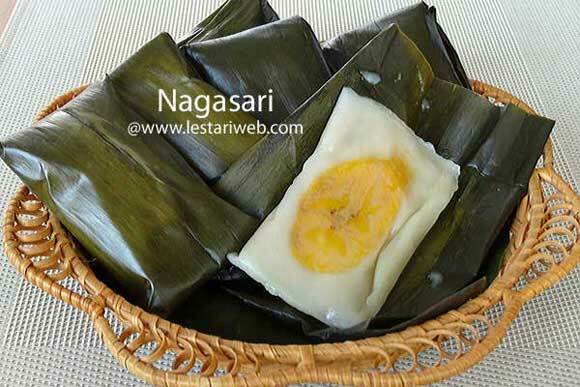 Nagasari, seems to be a mandatory snack for selamatan or communal feast in the middle & eastern Java region. 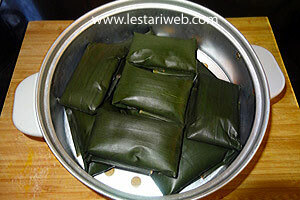 A selamatan takes place to celebrate almost any occasions, including birth, marriage, death, moving house, and so forth. Frankly as I remember in my childhood time, there were times when I was really fed up and tired of eating the same snacks or desserts including Nagasari, as often as I saw my grandma made the orders from the neighbours, especially during the wedding season !! Now after living abroad I feel like craving for the food I've thought long forgotten ;-) . 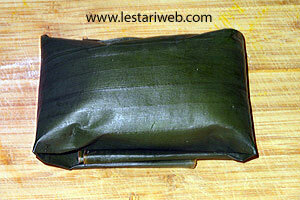 Tips: If banana leaves are not available, just take aluminium foil as substitute. Sure you will miss the aroma of the leaves but it still taste good!. Important Note: In Indonesia we use pisang Raja (Latundan/Apple Banana) and pisang Kepok (Saba Banana) to make traditional snacks or desserts. Those two sorts of banana make a delicious, firmly form & constant colour after cooking. Unfortunately they are not always available almost rare in the west. 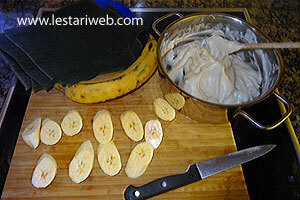 As an alternative, take a ripe plantain (Musa paradisiaca) as a substitute. This plantain is available in almost all asian shops. 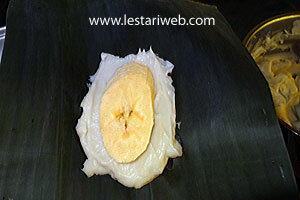 Do not replace with fruit banana, because its colour will turn to a bluish-black after cooking. 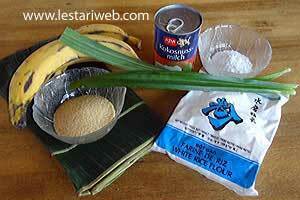 Mix the rice flour, tapioca flour and salt in a bowl. 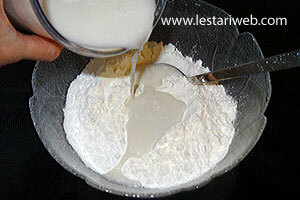 Add 250 ml coconut milk into the bowl, a little in a time & stir to mix. Stirring well to get very smooth batter. 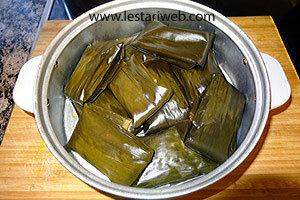 (If necessary srain the batter with the kitchen sieve to remove any lumps. )Put aside. 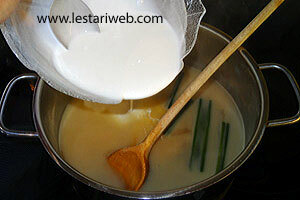 Add the remaining coconut milk into a saucepan. 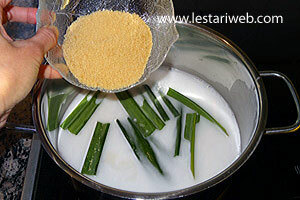 Add sugar, salt & pandanus leaves. Bring over medium heat into boil. Remove from heat. Pour in the batter into the saucepan. Stir the mixture with spatula. 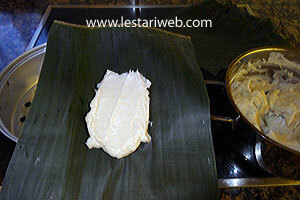 The batter looks so thin as coconut milk but don't worry since it will get thicken after being heated . 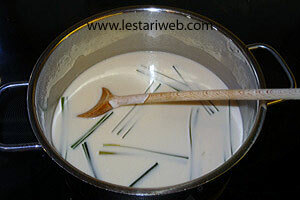 Heat the saucepan over a low heat & stirring with a wooden spoon continuously to perform a thick and smooth custard. (Importand Tips: Do not cook over medium/high heat or leave the rice batter unattended even a while during the process of heating and stirring, otherwise the dough will be lumped very badly. 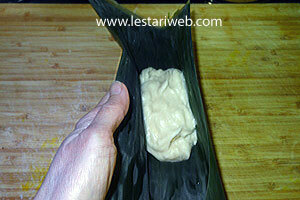 At the beginning of the cooking process, the dough sometimes looks a little bit lumpy and unevenly cooked. Ignore it & keep stirring contantly, the dough will turn smooth eventually by itself. 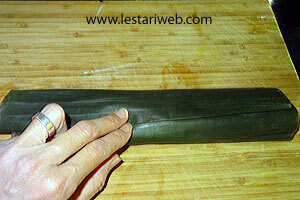 Peel-off the bananas and cut about 1 cm thick diagonally. 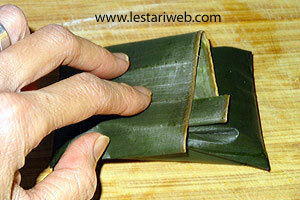 Prepare a piece of banana leaf. Spoon 2 tablespoons of the custard somewhere in the middle of the banana leaf. 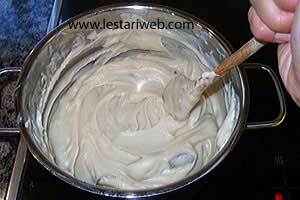 Put a sliced of banana on the top of the custard & *** add with the custard onto banana to cover it. (*** Sliced banana should not be covered with custard if you preferred Nagasari with a beautiful appearance as seen at the pic. above). Just add more custard at the bottom otherwise). 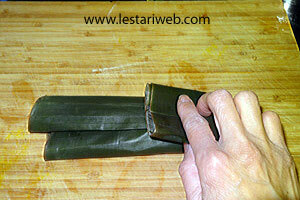 Wrap in "Oblong style" by enclosing the two remaining sides of banana leaf, then fold the both ends under the parcel (please see the pictures attached). Steam the parcels for 30 minutes since the steamer begins to sizzle. Serve warm or cold. Terima kasih, resepnya praktis dan saya akan segera mencobanya semoga berhasil.